Tropical depression Manuel is forecast to strike Mexico as a tropical storm at about 00:00 GMT on 19 September. Data supplied by the US Navy and Air Force Joint Typhoon Warning Center suggest that the point of landfall will be near 23.9 N, 109.0 W.
Manuel is expected to bring 1-minute maximum sustained winds to the region of around 64 km/h (40 mph). Wind gusts in the area may be considerably higher. 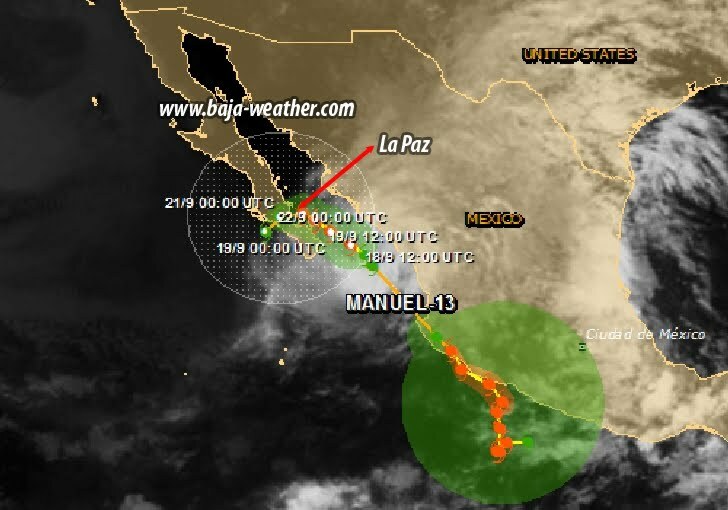 At 800 PM PDT...0300 UTC...the center of Tropical Depression Manuel was located near latitude 23.0 north...longitude 107.7 west, about 85 mi...135 km W of Mazatlan Mexico and about 140 mi...225 km E of Cabo San Lucas Mexico. The depression is moving toward the northwest near 6 mph...9 km/h...and this general motion is expected to continue during the next day or two. 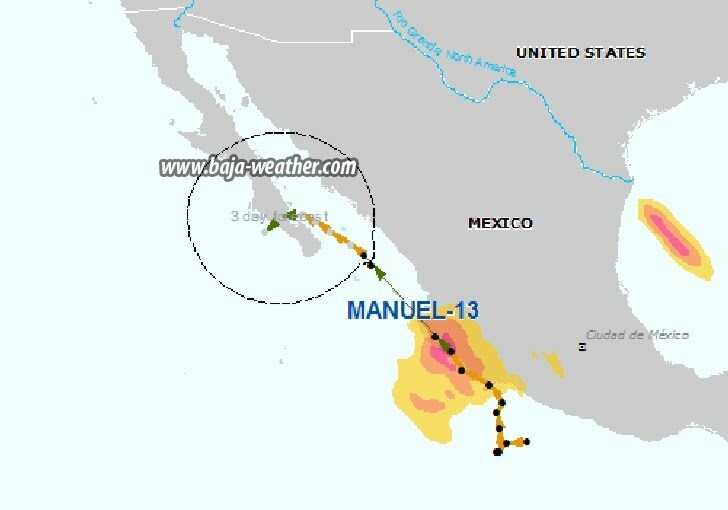 Rainfall: Manuel is expected to produce 3 to 5 inches of rain over portions of the Mexican states of sinaloa and nayarit. It is also expected to produce 5 to 10 inches of rain over the southern portion of the Baja California peninsula...with isolated maximum amounts of 15 inches possible. These rains are could produce life-threatening flash floods and mud slides. Wind: Tropical storm conditions are possible along the west-central coast of Mexico within the watch area during the next day or so. Tropical storm conditions are also possible in the southern Baja California peninsula within the watch area by late Wednesday night.